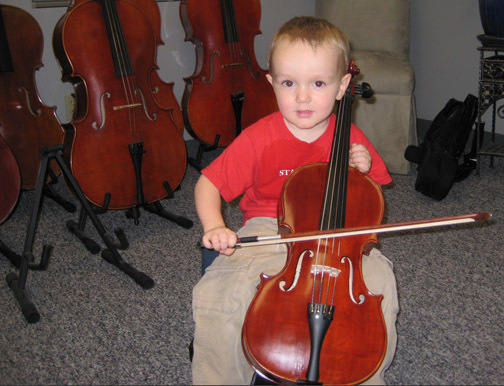 We carry all available sizes of violins, violas and cellos, including our custom built 1/16th cello modeled after the Suzuki “Nagoya” for our very youngest cellists (as shown below). And then he grew! 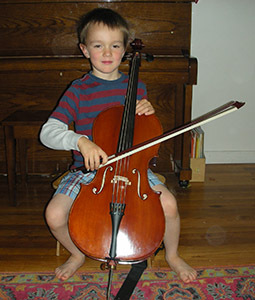 Most recently he is playing on a 1/8th cello! 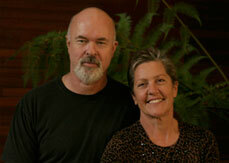 His mother and all his siblings play stringed instruments as well. Please feel free to contact us with any questions you may have. Our Rental Outfits include: • The instrument, bow & shoulder rest. • Case or bag & identification tags. • Rosin & cleaning cloths.Learning to play a stringed instrument is a challenging endeavor. Quality instruments with the correct setup will make a substantial difference in a beginner’s ability to develop strong fundamental technique. Set-up includes planing the fingerboard, fitting the pegs, acoustically cutting the bridge, fitting the sound post, and installing top quality strings on a Whittner tailpiece that has four built-in fine tuners. Rental fees are billed automatically to a credit card every 90 days. Two credit cards are appreciated to be on file, in case initial card provided is declined. Please call us to update your information if there is a change in the expiration date or if you have changes in your address, phone numbers, credit cards, or are planning to return the instrument. Please note that The Violin Shop does not send out billing reminder notices. First 6 months rental fees are applied 100%. Additional month's rental fees are applied 50%, up to 1/2 the value of the instrument. Please feel free to call for an exact quote with tax, if interested in purchase. As your child grows, you may exchange your purchased rental instrument for a larger size of the same rental model at no additional charge. First full year rental is applied 100% toward upgrade. Please call to schedule an appointment to try out the wide range of upgrades available. We will gladly trade back an instrument (from the original customer to whom the instrument was sold) toward the purchase of another instrument owned by us which is of equal or higher value. The trade-back value is 100% of the purchase price minus any costs necessary to that instrument to a sellable condition. For instruments with greater damage, we deduct for repair and also for devaluation. If the price of the new item exceeds the trade by less than $400, there will be a $50 deduction on the trade-back in order to compensate for our time of processing the exchange. If the price of the new violin/viola is higher by $800 or more (cellos $1,500 higher or more), than the original price of the trade back, we do not deduct for the following routine procedures: cleaning planing the fingerboard replacing the strings Our cost for these procedures varies between $120 and $540 for violins/violas and between $200-$750 for cellos. Again, these deductions are only necessary if the next instrument is not high enough in value that we can absorb the cost. We always deduct from the value of traded instruments for cracks, scratches and other damage; in serious cases, devaluation is necessary. Note: excessive scratches take a great deal of time to retouch and can be costly Please do your best to minimize the amount of scratches on your instrument. With bows, the trade-back value is 80% of the purchase price less necessary repair work and possible devaluation. The most frequent deductions are for a rehair, for a new thumb leather and for replacement of a broken tip. Because of costs for these repairs, it usually is not possible to trade back a bow valued at $100 or less. Our trade- back policy may be changed at any time.